FreeP vs. Food is a recurring series where we send four FreeP staffers to four local food establishments and try a similar item from each place. We give each place a letter rating based on the quality of the food, the service and the ambiance of the restaurant. This round, we’re asking the question: who’s the smoothie king of the Boston area? 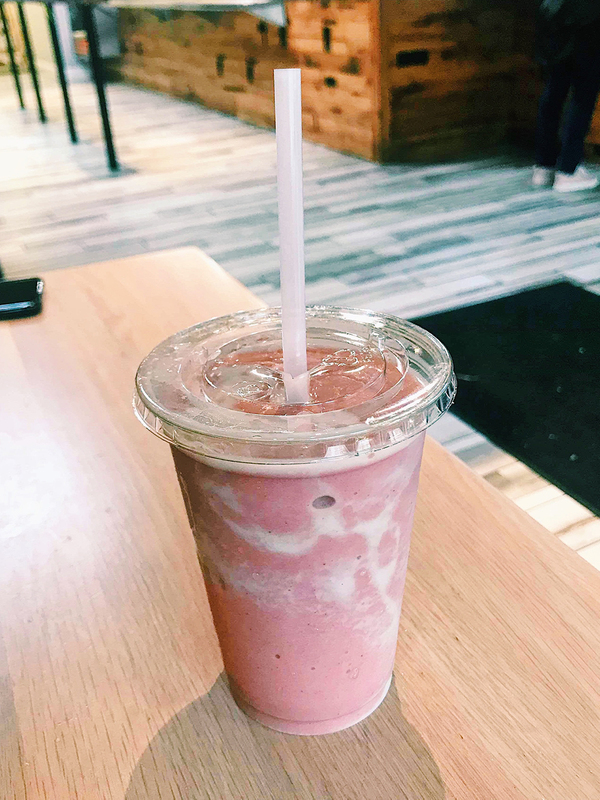 If you’re looking for a good smoothie as well as a mini-adventure off campus, Pure Cold Press in Brookline is the place to go. Pure Cold Press, a kosher juice and salad bar, is located a few minutes from the Coolidge Corner MBTA station on the C branch of the Green Line, or about a half hour walk from central campus. It’s also close to other Coolidge Corner attractions, such as Brookline Booksmith and the Coolidge Corner Theatre — perfect for a nice afternoon off campus. One of the few downsides to Pure Cold Press is its hours of operation. It’s open 8 a.m. to 8 p.m. Sunday–Thursday, 7 a.m. to 2:30 p.m. on Friday and is closed on Saturday. The fact that it’s closed on Saturdays and Friday nights reduces the times when college students may be able to go, but it’s not a deal breaker. The quality of the smoothies is enough to get you to go no matter what day of the week it is. I got a “Strawberry Fields” smoothie with strawberry, banana, mango and almond milk for $7.50. The smoothie was the perfect consistency and allowed me to taste every fruit that went into it without being too overwhelming. The selection of smoothies was also impressive. One of the more intriguing options was the “Energize” smoothie, made with cold brewed coffee, cacao, peanut butter, banana and almond milk. I’ll definitely be back to try that one at some point. In addition to smoothies, Pure Cold Press also has a variety of food options, including salads, soups, sandwiches and acai bowls — all of which are kosher and many of which are vegan and vegetarian friendly. For these reasons, Pure Cold Press gets an A from me. The Warren Towers Jamba Juice is like, well, the Warren Towers dining hall. It may not be my first choice, but it’s always there for a good time. With poor seating and an overheated, cramped space, the atmosphere isn’t cute. But don’t discount the juice. For a relatively fair price of just over $6 when including tax, you can get a fantastic, generously sized smoothie. We made our own with blueberries, bananas, strawberries, soy milk and almond butter. We wanted coconut milk too, but they were out — boo. The selection of ingredients isn’t extensive, but they do have all of the essentials. I wasn’t personally a fan of the packaging — which had lots of plastic and straws — so I recommend bringing your own reusable cup. 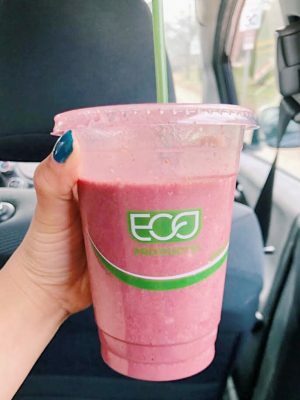 The consistency of our smoothie was fantastic — you could taste every flavor, and even the occasional chunk was enjoyable. The smoothies don’t come with any garnishes or whole fruit on top, but Jamba Juice has a good selection of bowls, if you’re into that. The service was super quick, but the place does get packed, so plan to wait for at least 5 or 10 minutes. You probably won’t want to stick around in the actual store because it’s so loud, but it’s a solid place to start your daily grind. 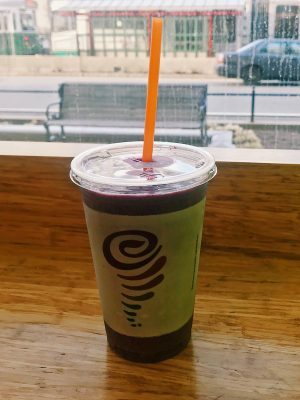 You can use convenience points, of course, but if you have a Jamba gift card, you’re out of luck — the Warren location won’t accept it for some reason. For a bangin’ smoothie, nice service and, honestly, for just being there for us — we give Jamba Juice an A-. I know what you’re thinking: why would I take the B branch of the Green Line all the way to Boston College for a smoothie? That’s what I was thinking, too. But Playa Bowls was surprisingly accessible. As soon as I got off at the last T stop, I didn’t need to pull out Google Maps — the place was right in front of me. Playa Bowls is located right near other food shops, too, if your friends don’t do smoothies. Playa Bowls has very boho-beach vibes, with a beachy, summer kind of theme that is incredibly refreshing to see in the cold city of Boston. The menu was extensive. It featured a long list of bowls, smoothies and juices. Needless to say, it took me a while to decide on something. I built my own strawberry banana smoothie, including strawberry, banana and coconut milk, but I asked for cow’s milk instead — which they didn’t have. Unfortunately, Playa Bowls did not give me the best smoothie I’ve ever had. Instead, it tasted a bit bland and powdery. However, a friend of mine got the “Acai Energy” smoothie which had acai, strawberry, banana and coconut milk in it. It was delicious, and the flavor was strong. Overall, the store is a nice place for a hangout. The smoothies we had were of good consistency and were made with fresh fruit. If you’re a fan of the natural, this place is for you. The staff was friendly, and the prices were the standard, with smoothies going for around $7–$8. The packaging was also eco-friendly, a big plus. For all that, I will overlook the strawberry banana disaster and give Playa Bowls an A-. Walking into Life Alive, I asked myself why anyone would pay $7 for a smoothie. Walking out of Life Alive having drank said smoothie, I asked myself that same question. The flavors that Life Alive offers are sophisticated and multidimensional, featuring high-brow ingredients such as maple, cashew, blue-green algae, dates and golden berries. And while these additives are unique to this local Massachusetts-based, vegetarian and vegan-friendly cafe, they don’t actually enhance the flavor of the smoothies. Although the “Love Child” I ordered was delicious — featuring banana, blueberry, strawberry, chia, dates and coconut milk — it was definitely something I could have made at home, especially given how natural and minimalistic it was. However, if you’re in it for a cute Instagram story, despite your wasted money, this place could be for you. The atmosphere of Live Alive is just as wholesome as you’d expect, and their smoothie aesthetic is no different. 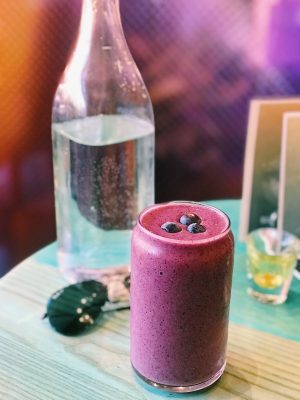 Served in a symmetrical glass and topped with a blueberry garnish, the “Love Child” was love at first sight. But I don’t think our relationship lasted to the bottom of the glass. If the portion size was bigger and the flavor was a little sweeter, I may be up for a second date. It’s a great smoothie for a health nut with a disposable income, but maybe not a regular treat for a college student.